In this adventure, there’s a Captain America, a Wasp, a Songbird, a Hawkeye, a Captain Marvel and 2 Hank Pyms (Yellowjacket and Goliath), seemingly plucked out of the past, present and future. It’s these seven heroes that must save all of humanity. Their adventure takes them to different times, places and non-places (Chronopolis) to defend Rick Jones and to find out why exactly Immortus wants him dead. There plenty of thrilling battles and characterizations. The relationships between the Avengers, some enemies with one another at different points of time, is definitely riveting, though confusing at times if you don’t know the complete history. Rest assured, Busiek writing style will remind readers several times exactly what’s going on. Among these is a grand characterization of Kang the Conquerer. Issue #9 goes in dept in exactly how he came to be, his mental state and justification for being a conquerer and his fear of turning into Immortus. Good stuff. Carlos Pacheco’s art is on equal footing with Busiek’s story as it was able to convey the plot brilliantly. With several 2 page spreads he definitely makes battles that much more epic. He crammed hundreds of Avengers on each page and I personally loved it. 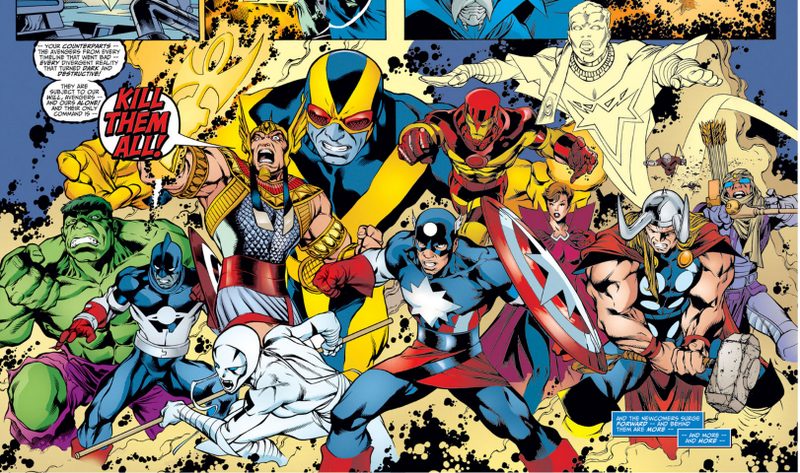 I feel Avengers Forever is a great segway into the modern Marvel universe. Busiek’s narrative does a superb job explaining several times the history of key relationships between characters and events. And also foreshadows future events i.e. the next Captain Marvel. New and returning readers to the Marvel universe will only be temporarily confused. Trust that Busiek will explain all. Though it doesn’t hurt to know who Captain America is. The best place to get this gem is at Amazon.com for around $20 for the trade. If you’re like me and like to collect the back issues, you can find them at cons from $1-$2 each. Not bad to get your hands on an original copy.